The supply situation remained good throughout the entire year. Blood donation opportunities need to be easily accessible to keep existing blood donors and to bring in the new blood donors who are urgently needed. The supply of blood products to hospitals needs to be aligned as closely as possible to demand. This is challenging, because while donated blood has only a limited shelf-life, it is essential that reserves should not be allowed to fall below a critical level. The supply situation in 2017 was consistently good. The summertime shortage that is often seen did not appear. This was partly due to the intense marketing and recruitment activities in the summer months. Another factor was the weather: there were no long periods of hot weather, which normally have a negative effect on blood donation numbers. There were 282 421 units of blood donated in 2017. This is 4.3 per cent below the 2016 figure. This decrease corresponds fairly well with the drop in blood use. However, the expiration rate of 1.9 per cent was above that of 2016 (1.4 per cent); this figure has been on the rise since reaching an all-time low (1.4 per cent) in 2015. In Europe, an expiration rate below 5 per cent is considered excellent. Switzerland now ranks in the middle of the list though, behind the countries with the best rates. Structural measures should help to simplify the planning process and keep the expiration rate down, among other things. Swiss Transfusion SRC is responsible for managing the blood supply at the national level. Since 2016, it has operated an online portal that allows the regional blood transfusion services to get a general idea of the available stocks at any time. Nonetheless, smaller, rural regions still have a hard time compensating for major fluctuations in the need for blood and the effects of patient blood management. In light of this, and other circumstances, merging into larger units can be advisable. A case in point is the merger of Valais’ regional blood transfusion service into the Interregional Blood Transfusion Service SRC on 1 January 2017. A substantially more far-reaching decision was taken by Swiss Transfusion SRC and the regional blood transfusion services in 2017: the result will be the introduction of four acquisition and supply zones of similar size in Switzerland, each of which will act with considerable autonomy to manage the blood supply throughout its territory. This will allow blood acquisition activities to be better tailored to demand, and will permit a simpler and more efficient planning/management of the blood supply at the national level. Implementation is slated for completion in early 2020. The regional blood transfusion services depend on competent and specialised staff. However, finding suitably qualified young professionals has become a problem in the fields of blood donation and transfusion medicine. So Swiss Transfusion SRC undertook a multi-year personnel development project, funded by the SRC Humanitarian Foundation, which concluded in 2017. This project made it possible to provide needs-oriented initial and continuing training to staff in key positions in blood donation and transfusion medicine. Optimising structures and ensuring that expertise is maintained are one aspect. At the start of the value chain, though, are the myriad of people who donate blood. It is essential that donating blood be a pleasant and straightforward experience for them. With the «Terminsuche» app, people can find out at any time when and where there is an opportunity to donate blood in Switzerland. The search app has proven very popular. In the past three years, access numbers have risen 27 per cent, coming in at almost 130 000 for 2017. Some blood donors prefer to donate at local mobile blood drives, which are regularly held in more rural areas. 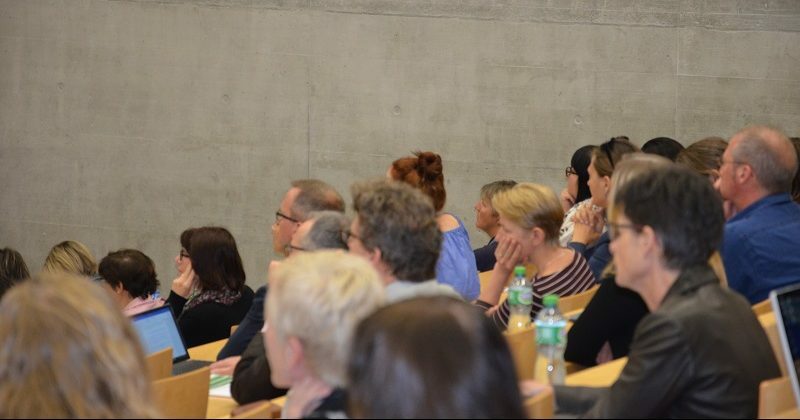 A large share of these drives are organised by the local Samaritans, who are true experts at motivating people to donate: almost half of the donations underpinning the basic supply of blood products for Switzerland are collected at mobile blood drives. In 2017, mobile drives accounted for 47 per cent of donated blood (2016: 44 per cent). A total of 1845 (2016: 1820) blood drives were held in 960 locations (2016: 928). The average number of donations acquired per drive, 71.6, was comparable with those of previous years (2016: 71.3 donations). Other blood donors prefer the urban donor centres. In 2017, these centres accounted for 53 per cent of blood donations. For some years now, the normal policy at the centres has been to request different groups of blood donors to come in as needed, i.e. depending on which blood group is required. The loyal blood donors who have been donating for years ensure the availability of sufficient units of donated blood. However, in time, many of these donors will become ineligible to donate due to age. This might lead to critical situations in the future, since the demographic trend will result in a renewed increase in demand for blood products in coming years. There is an urgent need for young people who are willing to donate regularly. For this reason, Swiss Transfusion SRC and the regional blood transfusion services decided in 2017 to engage in their first joint blood donation awareness raising campaign, with the aim of maximising impact. The campaign will kick off in 2018 and run for three years. It is initially aimed at the 30-45 age group and centres on young families. In the autumn of 2017, Swiss Transfusion SRC launched its Instagram presence as a way to supplement its Facebook activities. Instagram is used to reach out to the 18–30 age group. Through Instagram, the reach of influencers, who are very important for this demographic, can be used to raise awareness about both blood donation and blood stem cell donation among young people. For the even younger, new upper-secondary teaching material was published in late 2017. The workbook “Das Blut” (Blood), as well as its supplementary material, is aimed at students around the ages of 15–18. It builds on the previously released lower-secondary teaching material on the topic of blood, which was very well received by teachers. Blood groups were the thematic focus of Swiss Transfusion SRC’s marketing activities again in 2017. The continued and longer-term awareness-raising programme is intended to drive home to blood donors the message that the level of need for any given blood group varies over time. Moreover, the public generally finds the topic of blood groups quite interesting. Posters about blood groups already went up in Intercity and regional S-Bahn trains in the first months of the year. 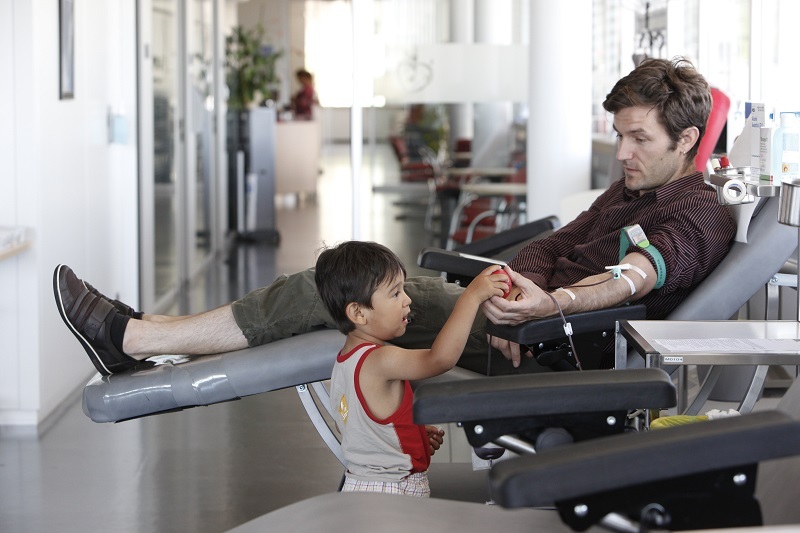 On World Blood Donor Day, 14 June, Swiss Transfusion SRC launched a campaign aimed at making the public more aware of the difficulty of maintaining the blood supply in the summer. In this context too, blood groups were at the focus. As a playful reference to missing blood, Berliner (jam-filled doughnuts) with no filling were given out in front of Migros stores throughout Switzerland, in a partnership with the retailer Migros. The media response was considerable. With the aim of further promoting knowledge about blood donation, a series of contests relating to the topic of blood were held with a range of partners from 19 June to 28 July. 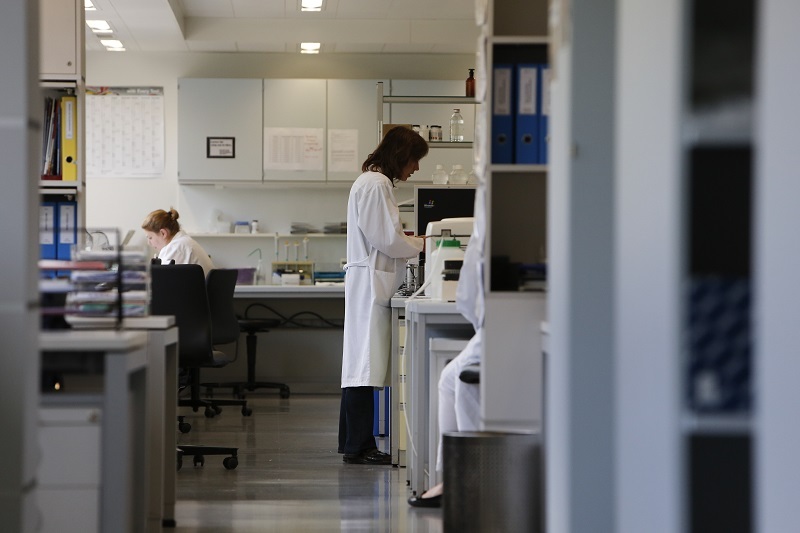 The campaign and the continual awareness-raising measures had an impact and helped avert a shortfall in the blood supply in the summer of 2017.